The power of crowds has been evident with a number of collaborative initiatives that have brought together likeminded online users. 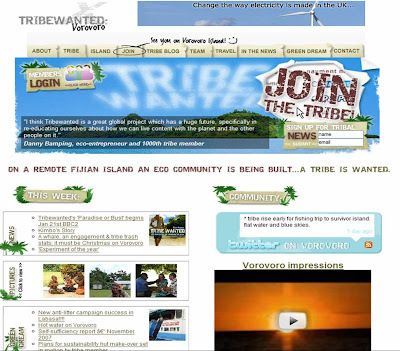 For example 30,000 people paid for a stake in www.myfootballclub.com which led to the group purchase of Ebbsfleet United football club and www.tribewanted.com created a combination of online community and real world sustainable tourism project on the Fijian island of Vorovoro. To date the UK political establishment have not tapped into this trend though. In 'Politics, Policy and the Internet' (a recent publication for the Centre For Policy Studies) Telegraph journalist, Robert Colville, argues that British political parties have failed to embrace the new opportunities online (see here where you can download the pdf of his full study). Indeed the British National Party website has the same market share as all of the other UK major parties combined. He argues that the major UK political parties could reverse this by altering their mindset from “send” to “receive”, by learning the lessons of unofficial organisations such as bloggers, activists and campaign groups which have exploited the potential of the internet. Whilst there are political blogs and sites like Webcameron, no party has truly engaged online communities in policy development. Downing St e-petitions have seen specific groups mobilised around particular issues (1 million people against roadpricing), but the UK has not seen anything similar to Estonia's 'today I decide' initiative that offered the Estonian public the chance to influence national policy and feedback on proposed new laws. In the US Presidential elections Ron Paul and Barack Obama particularly have shown how effective the internet can be as a vehicle for raising funds and engaging supporters. Ron Paul is an interesting case because his campaign has used the internet to generate support far exceeding the original predictions for his campaign. The US electoral system means that he was always going to struggle against the more established candidates and campaign machines, however his online strategy has set the bar for online campaigning (see my previous post here: http://www.nickburcher.com/2008/02/no-other-presidential-candidate-can.html). Ron Paul and Barack Obama's online tactics could be particularly effective in a democracy with a more focussed electoral timeframe (weeks rather than months / years) and some of these strategies could be well suited to the forthcoming election for London's mayor. The London mayoral election is the first really significant British election in a Web 2.0 world and over the next few weeks London is set to see some online political campaigning that has not been previously seen in the UK. Whilst things like Ken Livingstone's Search campaign are already running, the really interesting moves are around some of the independent candidates. The socially progressive website www.londonelectsyou.co.uk is offering to award £50,000 to the campaign of an independent candidate. This will be awarded to the winner of a sort of online primary that www.londonelectsyou.co.uk are running, with the candidate gaining the most online votes by 18 March qualifying for the financial support. Time Out magazine have entered their own independent candidate (Michael Hodges) into this competition and have flagged it, under the strapline of 'Vote Hodges', on the front cover of their magazine this week. Using public domain, online voter suggestions and feedback to influence an election manifesto is a clever idea and I'm sure the main UK political parties will start seriously investigating this sort of model for testing their own policy ideas. It is also a useful mechanism for bringing MPs closer to their constituents. Alternatively if the UK political parties do not adopt practices of this nature, it may not be long before www.mypoliticalparty.co.uk actually becomes a reality?